It is now the dead of winter. One winter storm follows another, even here in the desert. 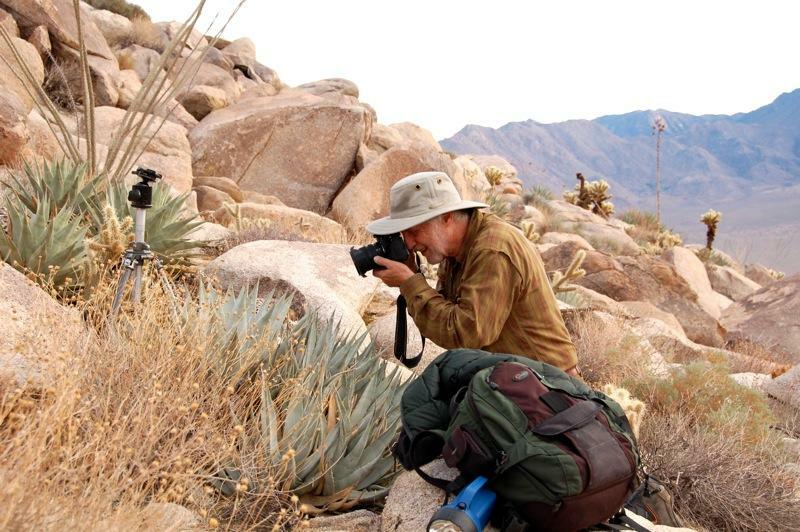 Heavier desert rain this season is a good harbinger for a prolific, early wildflower season. 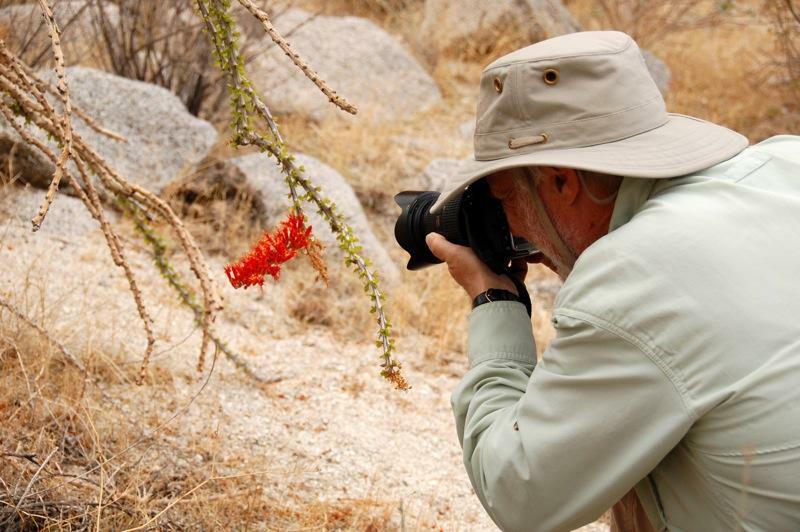 Just a few weeks ago we saw lush, green growth and the bright red flowers of the Ocotillo in Hellhole Canyon. 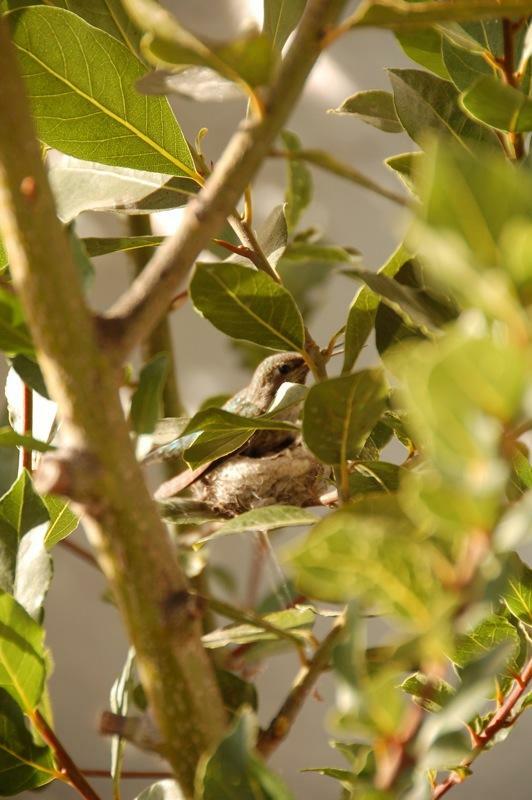 There is already a hummingbird nest with two eggs in our California Bay Tree just outside our den window. We are in the middle of the third rain and windstorm this week and rain is expected through Saturday. Each morning we peer outside our window to see if the nest survived the storms and each day we are amazed that the brave and dedicated mother is still there, hunkered down over her eggs. 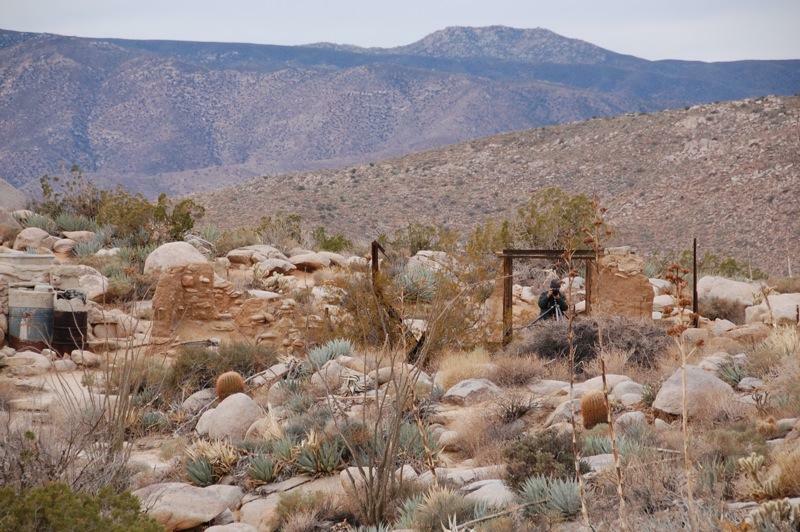 During my last visit to Marshal South’s home, Yaquitepec, on Ghost Mountain, I thought about the bravery of Marshal South and his wife, Tanya, in choosing this desolate site for their experiment in desert primitive living and in raising a family here. This is food for thought and, with a little champagne (and appropriate music), I’ll muse on and contemplate the passages of time and other mysteries of life and the universe. Bert and I have each been here before, but never at night. So we packed our gear and took a late afternoon hike on New Year’s Day up Ghost Mountain in Anza-Borrego Desert State Park to experience and photograph Yaquitepec and the night sky. 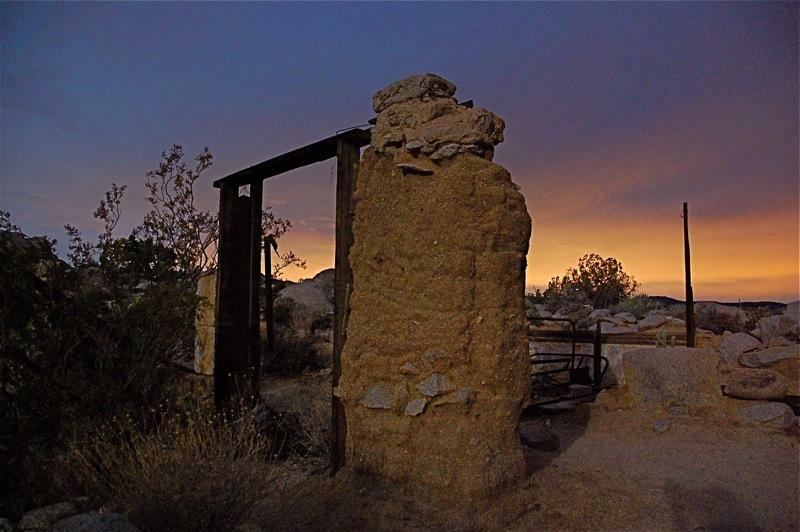 Yaquitepec is the name Marshal South (poet, author and artist) gave to his adobe house that he built atop Ghost Mountain, where he and his family lived from 1930 to 1947 in an experiment in primitive living. Some consider Marshal and his wife, Tanya, as the original hippie family. It was the time of the Great Depression of the 1930s, when people were without money, jobs and houses and went back to the land to survive, some, including Marshal and Tanya, by homesteading. 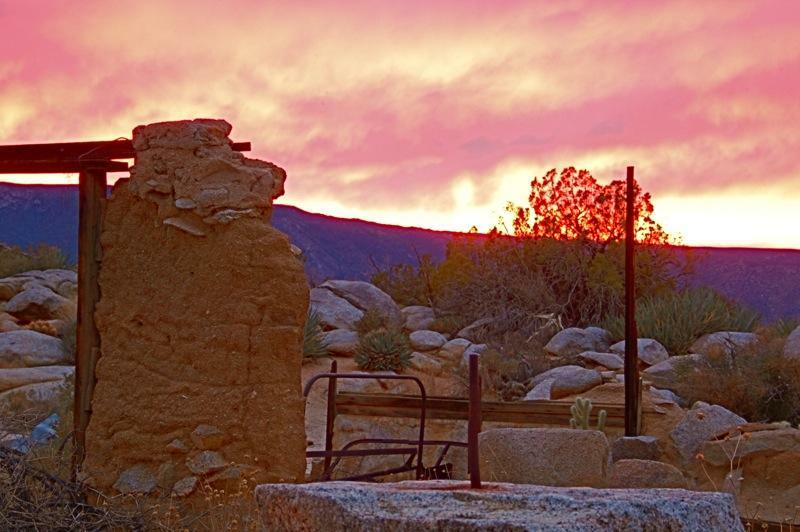 Years earlier they enjoyed camping trips to this area and loved the peaceful beauty of this desert wilderness, which enabled them to be creative in their writings after establishing a home here. Marshal wrote articles for Desert Magazine and monthly drove his 1929 Model A Ford 14 miles to the town of Julian to pick up mail and supplies. Some in Julian considered him an outcast because of his lifestyle. Even though he painted a frieze for the Julian library, he was buried in the Julian Cemetery in an unmarked grave in 1948 (it is now marked with a headstone placed by his son Rider in 2005). Along the way, Bert photographed this Agave plant, called Mescal by Marshal, who used it as a food and fuel source, among other things. We started photographing the deteriorating ruins under increasingly cloudy skies. After four prior hikes up here, I finally found and photographed the Souths’ kiln where they fired their pottery. 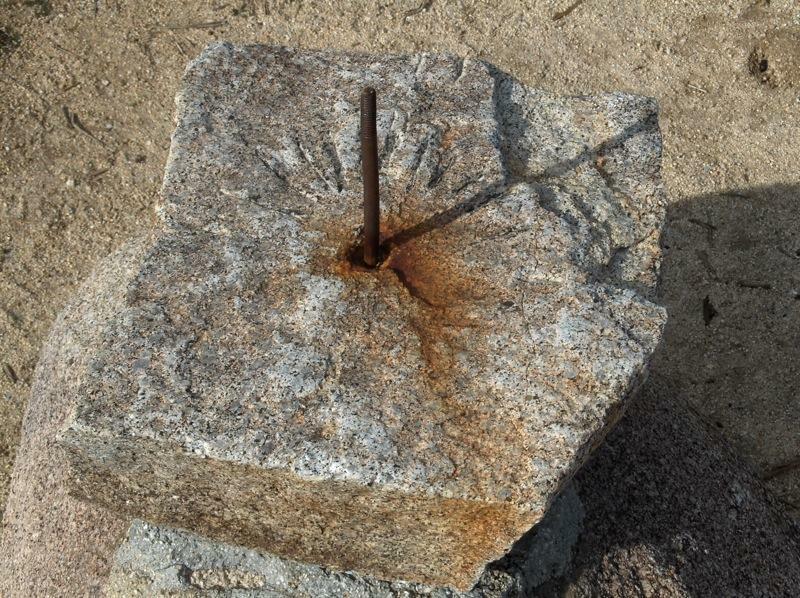 It is located about 500 feet east of the house and was built from the surrounding granite rocks. 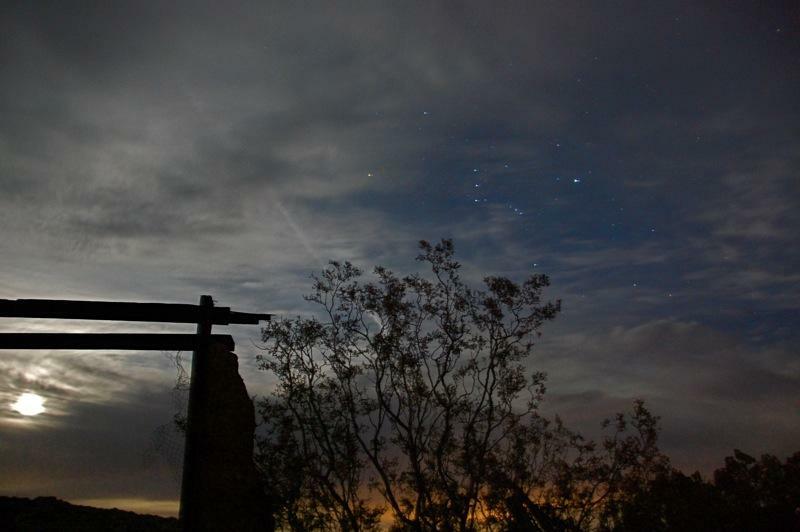 Although it was mostly cloudy, the night sky had pockets of clearing, revealing stars. 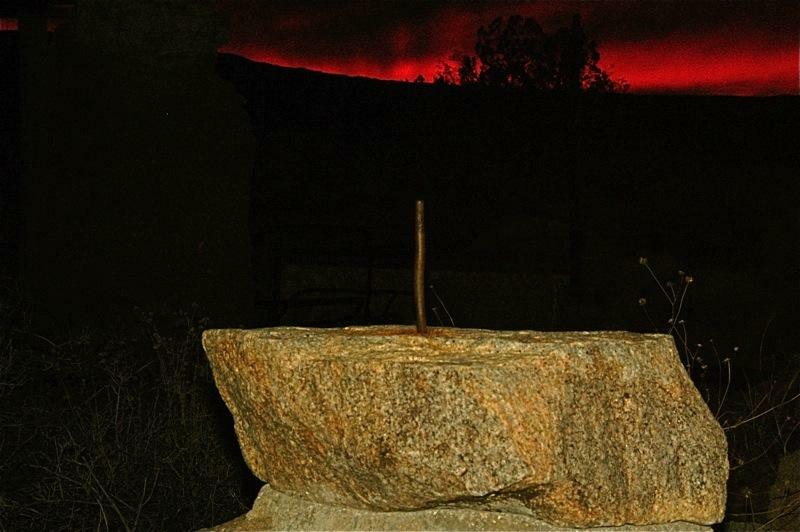 Bert lit up the opposite side of this structure with a strobe light and took the image seen in his article, “At Yaquitepec, Atop Ghost Mountain in Anza Borrego, January of 1940 Was a Very Good Year“. Afterward, he reviewed his photos (below). 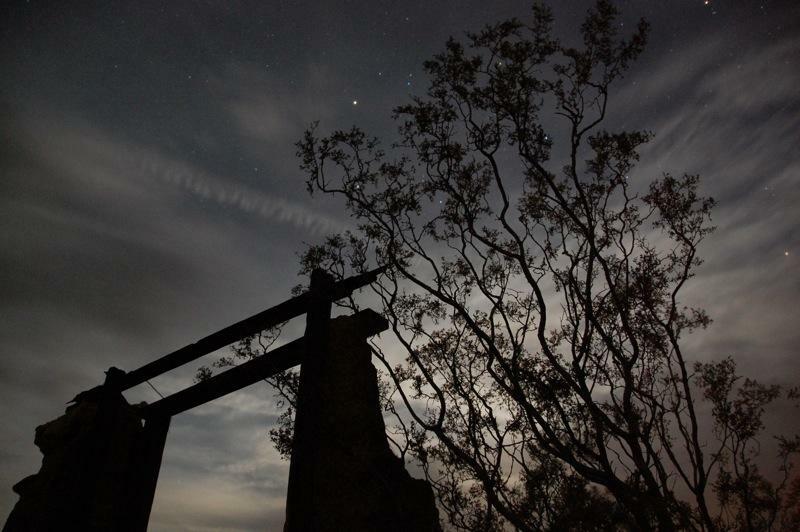 Tall agave stalks are seen against the night sky lit up by El Centro, fifty miles away and the largest U.S. city to lie entirely below sea level. 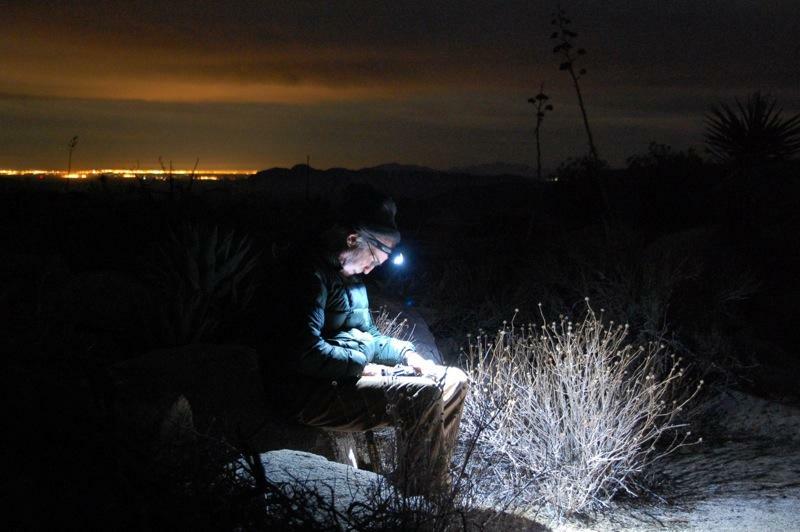 Bert’s headlamp lit up the yard in front of Yaquitepec. Earlier during the magnificent sunset, I reflected on the ongoing return of Yaquitepec to the earth and, like Marshal, I celebrated the life, beauty and spirit of this special place. And, all in all, for Bert and I, New Year’s Day at Yaquitepec was a happy day and a great way to start the new year. Also see Diana Lindsay’s website, MarshalSouth.com, for additional information, articles, images and links. 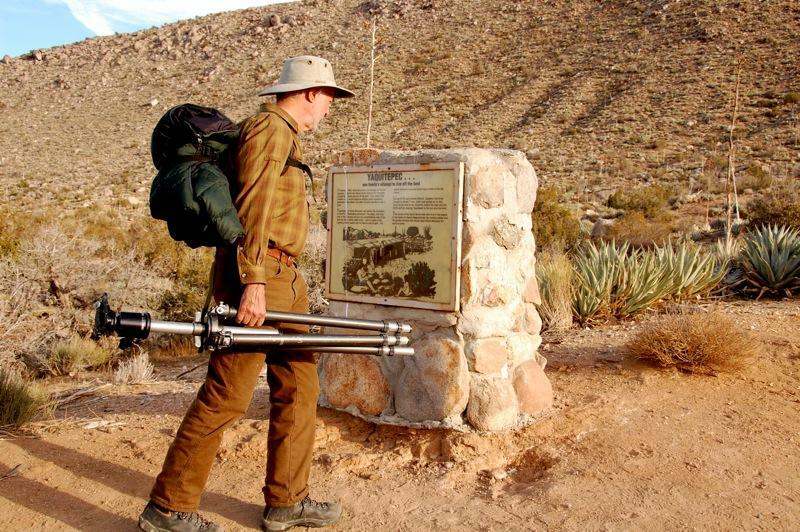 And see the video trailer of John McDonald’s 76-minute documentary, The Ghost Mountain Experiment. 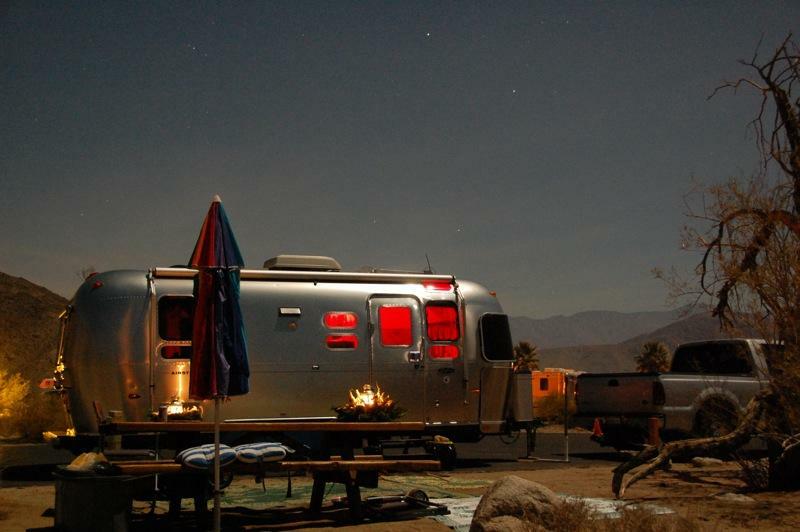 We celebrated New Year’s in Anza-Borrego Desert State Park under the light of the blue moon. A blue moon is the “extra” full moon in years that have thirteen full moons and occurs every two to three years. 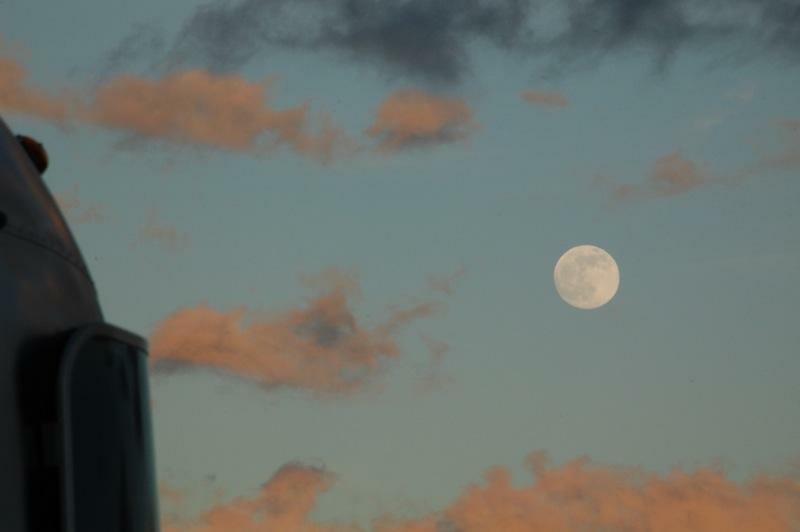 In early English usage, some interpret this “blue moon” as relating to absurdities and impossibilities. 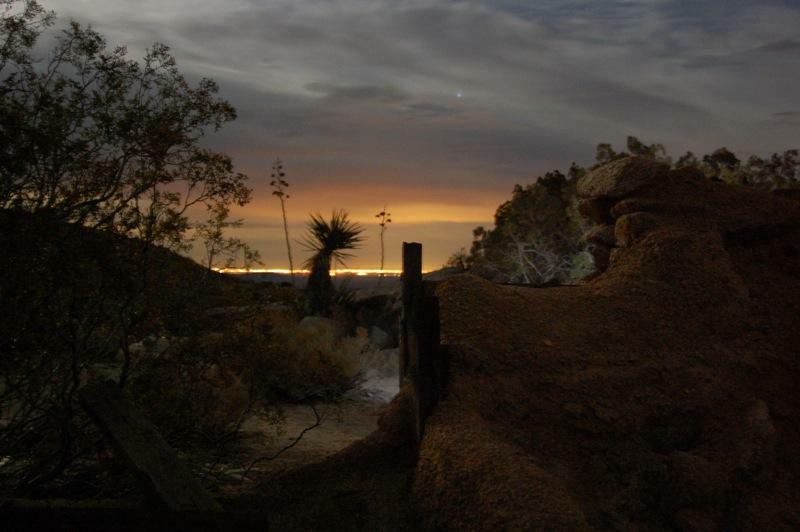 For us, it was a time to relax and enjoy the ambiance of this peaceful and beautiful desert setting. Larry brought along a juniper wreath made from the Hollywood junipers from our home, which looked quite festive as it held a candle lantern on our picnic table (seen above). 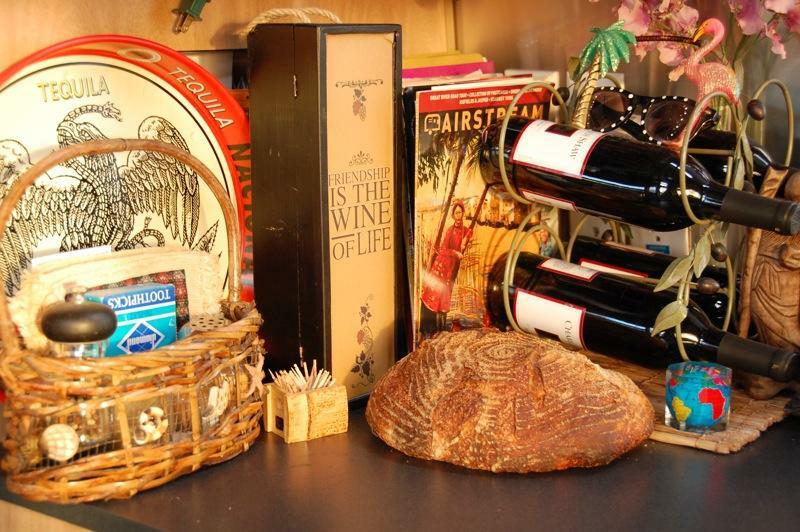 He also brought two delicious homemade artisan sourdough bread rounds, made using the “No Knead Bread Baking Method” (seen below). 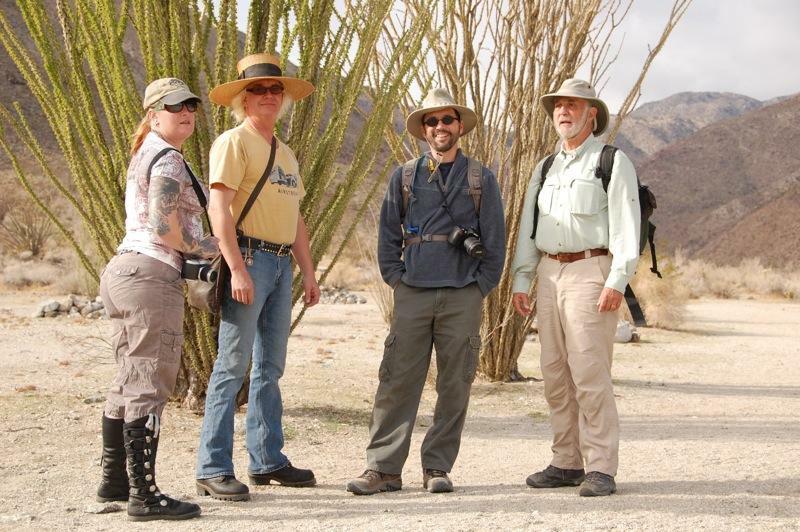 I joined Charon and Alex, Rich, and Bert on a hike up Hellhole Canyon. 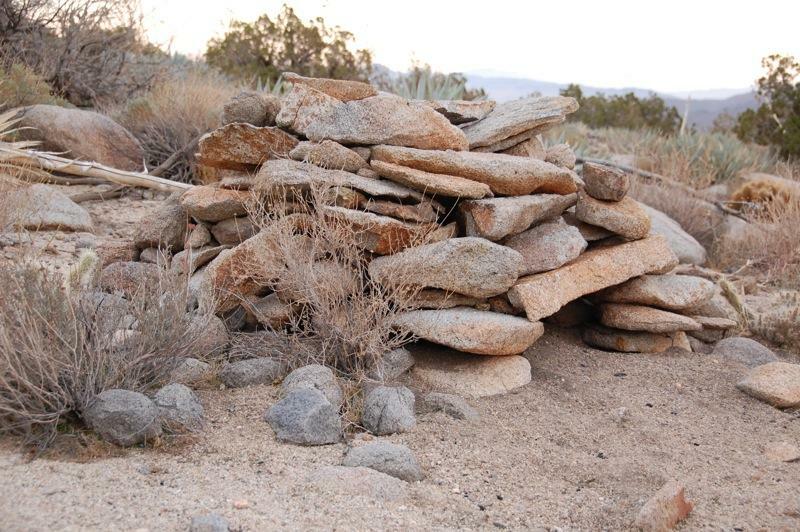 Hellhole Canyon hike is a popular introductory backpack trip for many youth groups. 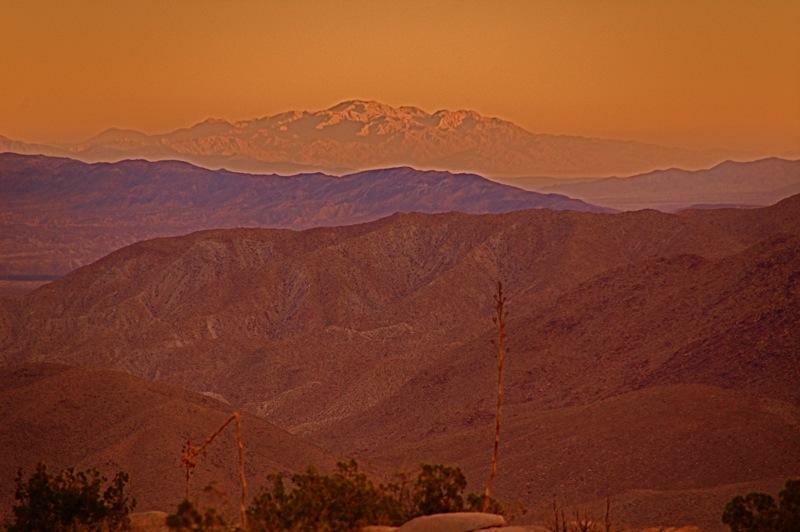 It is located south and west of the Anza-Borrego Desert State Park Visitor Center that climbs up toward Culp Valley. 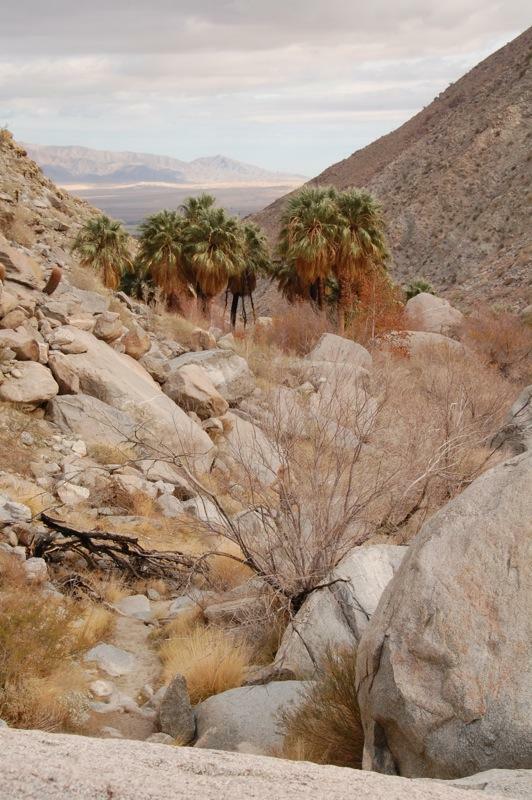 According to Diana Lindsay in her book, Anza-Borrego A to Z: People, Places, and Things, 2001, Sunbelt Publications, this canyon was named by William Johnston “Wid” Helm, who used the canyon to move his cattle on and off the desert for winter grazing. He reportedly said that this canyon was “one hell of a hole to get cattle out of”. A sign at the beginning of the trail alerted us that mountain lions have been sighted in the area. Bands of ancient metamorphosed sea beds can be seen on the north canyon wall. 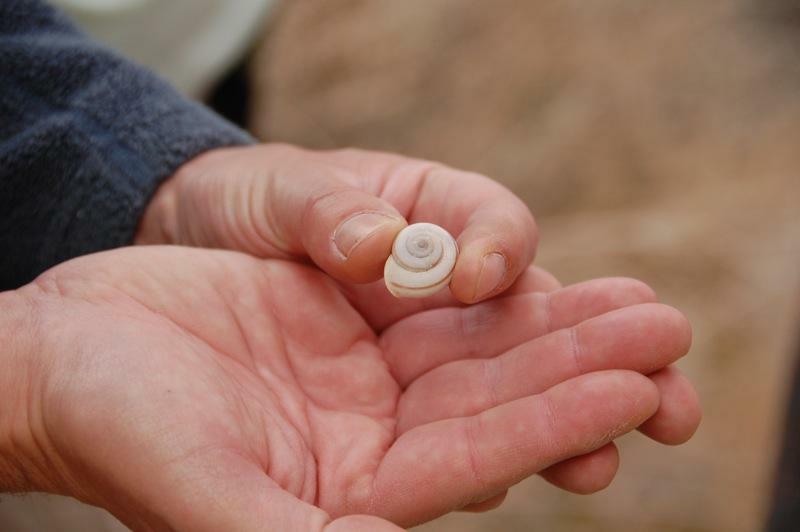 Indeed, we found a marine shell here (as seen below, held by Rich). Also along this canyon we saw new growth (due to recent rains) of lush, green ovate leaves and bright red flowers of the Ocotillo. This provided an opportunity for Bert to use his photographic skills and capture a stunning image of the blossoms. 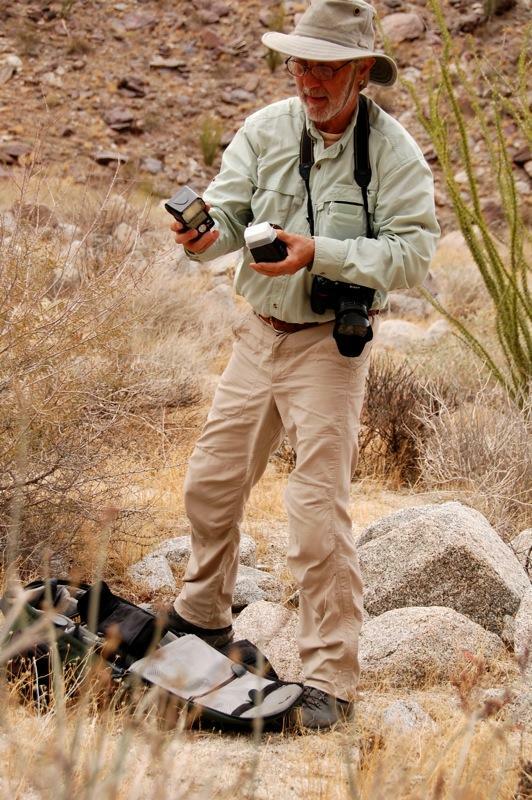 I gladly became the additional set of hands, while picking up photography tips from an expert! 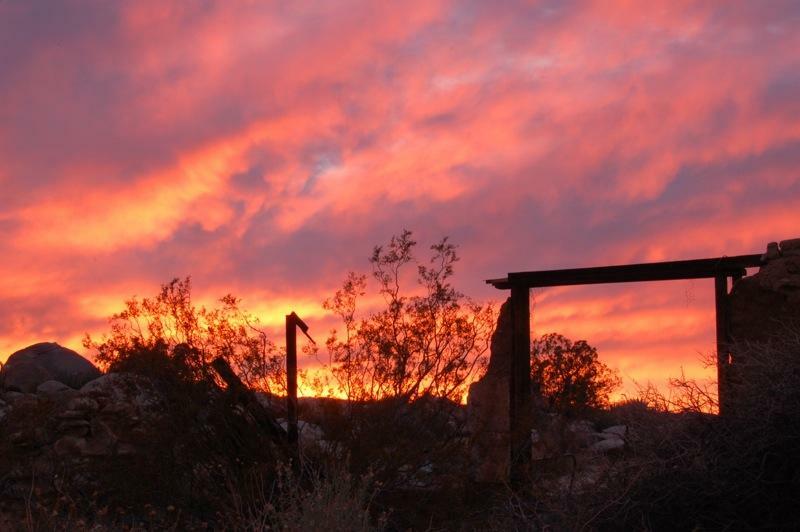 My next article will cover what Bert and I experienced and photographed during an evening hike up Ghost Mountain. Meanwhile, I’ll relax to the music of Blue Moon, accompanied by ukulele.